Usually, the mobility behaviour of children changes from primary to secondary school. Firstly, because the change of school is linked to a new and in most cases also a longer way to school and on the other hand it reflects the children’s development itself. They are striving for more autonomy from their parents while friends and leisure time are gaining in importance. The range of movement is enlarging, too. The bicycle is next to the public transport most suitable means of transport for children to be independently mobile in an eco-friendly manner. The project supports the children to learn to cycle safely and independently and to be mobile in an eco-friendly manner as it sensitizes for the environmental aspects of cycling. 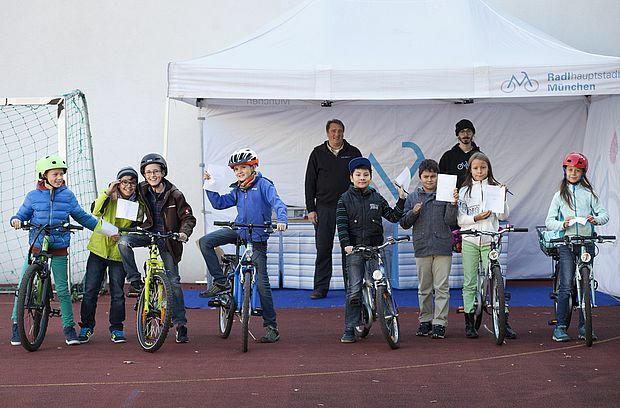 The bicycle trainings still enjoy great popularity among the schools. In 2016 alone, more than 1.400 children, primary school students as well as secondary school students, took part in the training sessions.